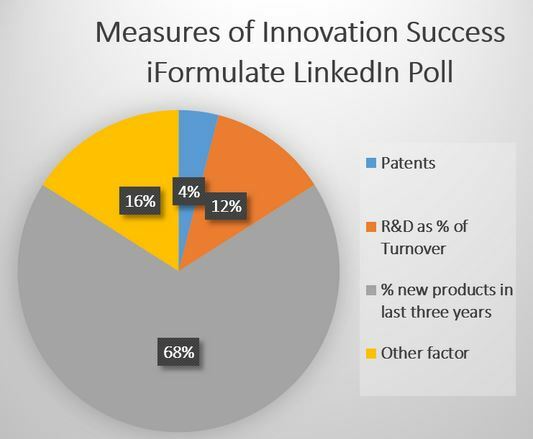 We recently ran a poll on our LinkedIn Group asking the group members what they would regard as a good measure for innovation success. The choices in the poll were inspired by a list issued by Reuters, which used patents as the major measure for innovation success and created a list of the top 100 innovators. The results from our poll are shown in the graphic. A clear winner from the poll was the opinion that the number of new products introduced was a good metric. Interestingly we saw not one vote for an increase in share price – I wonder how many CEOs of listed companies would agree with that? The comments from respondents suggested that the appropriate measure did depend upon the size and nature of the company in question. For instance a small formulating company may not have a patent portfolio due to the cost of filing and maintaining patents, but the company could still be regarded as very innovative. The lack of patent portfolio does not of course mean that there is a lack of IP.